It's still not clear exactly what "plus-size" means for menswear. Despite the body-positive movement and despite magazines and blogs talking about beauty in all sizes, the discussion has largely missed a big portion of population: men. Plus-size men's clothing. When's the last time you saw it featured on the cover of GQ or on the runway? There was only a "small handful of plus-size models" at this year's Men's New York Fashion Week, Mic reported. Tons of patterns and colors, but size diversity? Not a theme. Mic's conclusion: "What this says about the state of body positivity is that it still rests firmly on the shoulders of women. While womenswear and unisex designers have incorporated women of various sizes in their shows (from Chromat to Eckhaus Latta), designers firmly in menswear haven't been so moved." In other words, it's still basically a parade of "skinny boy,""skinny rock-star" boy and the "long, lean aesthetic" with a light sprinkling here and there of defined muscle. Meanwhile, the average waist size for American men 20 years old and up is 40 inches. There's actually still some uncertainty as to just what plus-size means for men. This was resolved for plus-size women some time ago. In the women's section, it starts at a size 12 or 14. For men you see "big and tall," but no solid definitions existing. There's an ongoing debate about the minimum waist circumference; some say 38, some say 40, others 42. And, of course, a man's height has to be taken into consideration. Things are changing, though. Take, for instance, the "dad-bod" trend. It's based on the idea that a man's body that's not "slim and toned" or "overtly muscular" can be attractive. A then-40-year-old Leonardo DiCaprio shirtless and bearded on a beach helped this trend. Playing off the dad-bod love, there've been "How-To" guides on maintaining the perfect "dude-gut," but that doesn't mean all big guys prefer Big Dog over designer duds. Economics is one culprit in the equation. 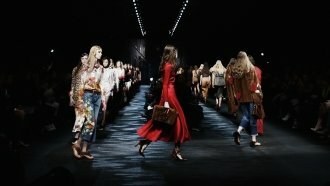 Dazed quotes one designer as saying that producing a variety of sizes for a fashion show can just be plain costly. Culture and psychology also play a role. Esquire magazine surmises that "some men distance themselves from the language of body positivity because they think it's unmasculine, but others feel uncomfortable encroaching on a movement they believe women deserve to own." But consider this: a husky 12-year-old, whether they're boy or girl, will look to fashion and entertainment to see if they're beautiful, if they're represented. The number of plus-size women in media is growing. Men with soft spots and love handles are still largely out of sight.